THE Woking Best Bar None Awards were launched this week, to encourage the highest standards in the town’s food and drink business. The accreditation scheme is aimed at preventing and reducing alcohol-related crime and anti-social behaviour as well as encouraging increased trade for the best businesses. The News & Mail has been chosen as the official media partner of the scheme. 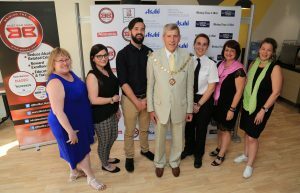 From left, Cllr Debbie Harlow, chairman of the Woking Borough Council trade licensing committee; Jade Buckland of the national Best Bar None organisation; Tom Harding of Ashahi; the Mayor, Cllr Graham Cundy; Inspector Emmie Harris; Camilla Edmiston, the WBC community safety manager; and Carol Miller of the News & Mail.